There are times when many of us wish we had more than one computer at home. Actually, you can never have enough time for your computing needs if you have to share one computer with other family members. Using dual monitors on a single computer system can really make a difference for an average home user! IBIK company is here to offer you our powerful ASTER software – one of the most advanced dual monitor programs allowing you to create several workplaces based on a single computer unit. The idea of using dual monitors is not a new one: dual monitor programs are widely implemented in commercial companies but not supposed to be used for home needs. Our progrаms shared computer access software is developed to help home users increase computer productivity and unlock its full potential. ASTER offers a simple and yet cost-effective way to use dual monitors on 1 computer transforming it into 2 separate workstations. 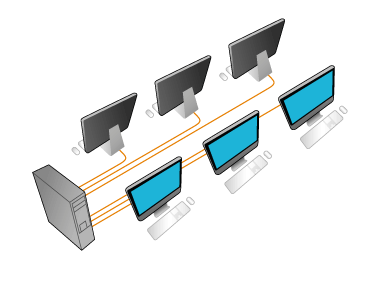 Essentially, by using dual monitors on a computer, you'll be able to support two completely independent users working simultaneously in their customized computing environment. Unlike similar shared access and dual monitor programs, ASTER doesn’t work with thin clients and terminal stations allowing you to equip a second workstation just with a second mouse, keyboard, monitor and video card. Moreover, installation and setup of our program is extremely easy and can be accomplished by any user, so as you can start using dual monitors in just a few steps. Do you have another spare PC monitor? Are you wondering how to obtain another computerized workplace on the basis of a single computer unit? It's a high time to increase your PC working potential by using dual monitors on a single computer! Take advantage of powerful ASTER software from IBIK and improve your PC performance with minimum investments.